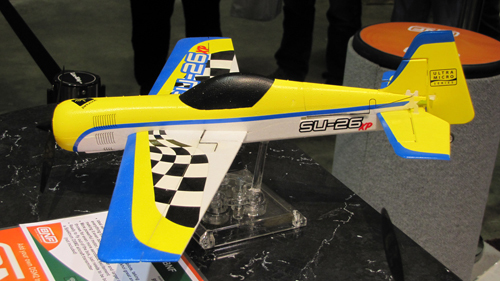 Sukhoi 26-XP BNF Now Shipping! Good news - we have just received word that the new ParkZone Sukhoi 26-XP is now shipping. We should see the shipment come in on Friday, June 11th. Because supply is limited, we're only receiving two planes. If you want one, give us a call and reserve one. They will be assigned on a first come, first serve basis. I don't see these sitting on the shelf for very long, so reserve one fast! In other news, we currently have a Losi TEN-T Nitro-powered Truggy in stock. It's going for the usual $499.99, but you get a FREE Losi Micro HighRoller truck with your purchase. This is limited to supplies on hand (which means the one that we have), and any special orders placed before June 30th. Come in and check out this truck - it's probably the best thing Losi has put out in the last few years. We've had a good response from the customers that have purchased one from us, which is always a plus. And it not only includes a Spektrum DX3S radio system with telemetry, but the engine starts with the push of a button - on the transmitter. It's certainly worth a look if you're thinking about getting a nitro vehicle.